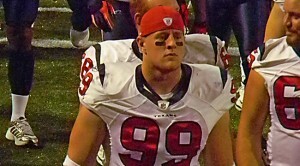 J.J. Watt helped lead KFFL.com’s Keith Hernandez to the top record in the regular season. We used the CBS Commissioner for this one, so the site is not accessible by the public. Keith Hernandez, KFFL, 9-4, 2114 – Top division winner. Monster years from J.J. Watt and Von Miller. McCoy and Gronk hurt now though. Dave Gawron, 5-8, 1840 – I had a better year than my record thanks to RG3, Megatron, Ridley. Didn’t get great production from my IDPs. Third most points allowed, lost three close ones with high scores.